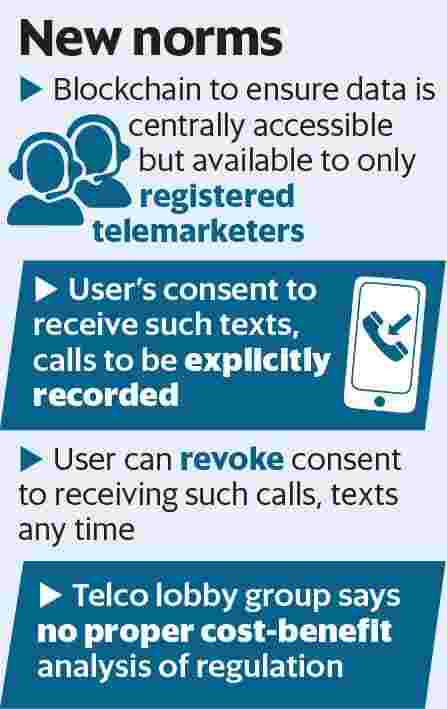 New Delhi: The telecom regulator has asked operators to adopt blockchain technology to ensure only registered telemarketers have access to phone databases and that user consent to receive such communication is explicitly recorded. The regulator has asked telecom service providers to use the distributed ledger technology to control the flow of commercial communication on their networks in its Telecom Commercial Communication Customer Preference Regulations, 2018. The rules were made public on Thursday. A distributed ledger, or Blockchain, is essentially a collection of records where every person who accesses it also has a copy. But participants have to agree to make a change in the database. Since blockchain secures information cryptographically through the use of ‘keys’ and signatures to control who can do what within the shared ledger, only registered telemarketers will be able to discharge certain functions. Last September, Trai had issued a consultation paper seeking comments on how to create a system for registering telemarketers and making the complaint redressal system better. This was prompted by the fact that spam calls persisted despite restrictions on telemarketers as people aren’t aware of the implications of sharing numbers and the absence of a robust mechanism to record consent. “This is a step in the right direction by Trai. Blockchain can effectively create a signature or a hash of an asset and instead of transmitting that entire digital asset, in this case the phone number, you can only put the hash on that database which can be accessed by the registered telemarketer. It will be like a virtual token of that digital asset. Blockchain can secure this database but in this case security is also needed at the point of origin of the data and before it is stored on the ledger i.e. ensuring that there is no leakage at the end of the telecom service provider generating the number," said Ajeet Khurana, a former head of the Blockchain and Cryptocurrency Committee of the Internet and Mobile Association of India. The rules issued by the regulator state that companies that want to communicate with interested users have to confirm their identity through a header registered in their name. In case the access provider fails to curb unsolicited commercial communication, there would be a penalty of as much as ₹ 50 lakh per month. Unscrupulous telemarketers often override the stated preference of the subscriber by claiming consent that may have been surreptitiously obtained. Under the new rules, access providers must now provide facility to digitally record and revoke consent of the subscribers. The telecom industry, however, is worried that there has been no cost-benefit analysis of this regulation at a time when the industry is facing financial stress. “We remain concerned about whether the regulation addresses the issues of unsolicited calls origination from unregistered tele-marketers. We are reviewing the regulation to see if this is adequately addressed," said Rajan Mathews, director general of Cellular Operators Association of India (COAI). “The time frame for implementing, especially given the requirement to implement distributed ledger technology, which has not been implemented by any other regulator, appears too stringent and difficult to achieve," said Mathews.